Join Us In The Anna Marie's Supper Tea! 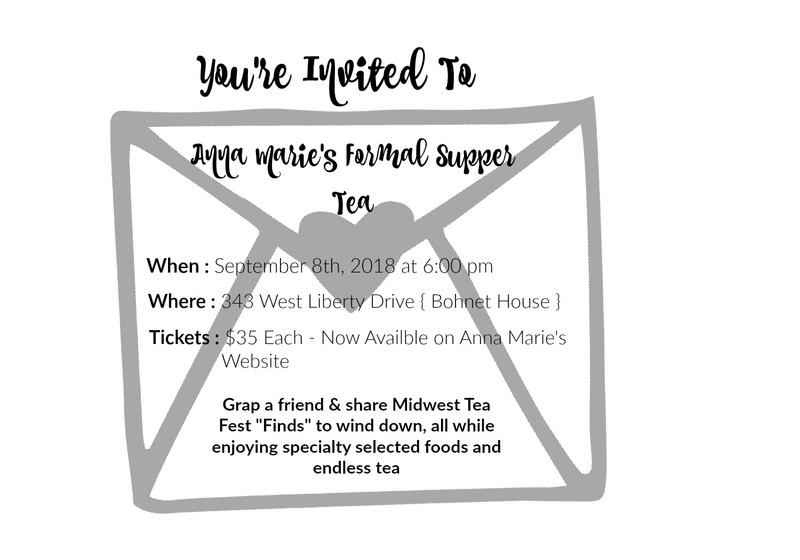 Bring loved ones, cherished friends or alone, and join us in the first ever Anna Marie's Supper Tea! Join us Sunday evening, after the Midwest Tea Festival and the Tea Crawl to take the time to relax, rest and un-wind! Enjoy a High Tea Supper alone or with a friend! Don't miss out! After the Midwest Tea Festival's final day on Sunday, relax at a classic Anna Marie's Tea Party. Tickets are available for purchase as of now! Take a fun trip, enjoy a cup of tea and get to know, understand, and enjoy all things TEA! Order in advance. Seating is limited!